Galloping on horseback across Pink Sands Beach, you look out across the Caribbean ocean as the warmth of the sun soaks into Harbour Island Bahamas' glistening pink sands. You explore the quiet lanes of New England colonial buildings set on either side, backed by the colourful flowers, green palm trees and turquoise ocean. The mouthwatering scent of cracked conch fills Dunmore Town as you take a seat at an oceanside restaurant. 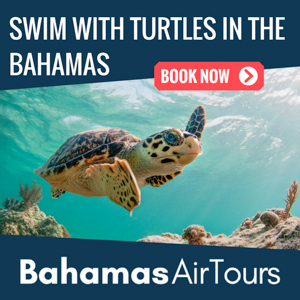 Climbing aboard a luxurious yacht, you set off to snorkel the hidden secrets of the shimmering Bahamian ocean. Galloping on horseback across Pink Sands Beach, you look out across the Caribbean ocean as the warmth of the sun soaks into Harbour Island Bahamas’ glistening pink sands. 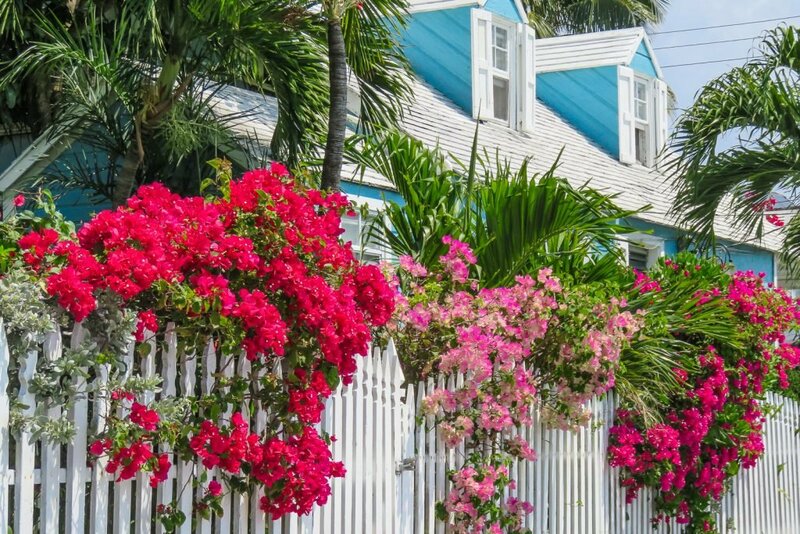 You explore the quiet lanes of New England colonial buildings set on either side, backed by the colourful flowers, green palm trees and turquoise ocean. The mouthwatering scent of cracked conch fills Dunmore Town as you take a seat at an oceanside restaurant. Climbing aboard a luxurious yacht, you set off to snorkel the hidden secrets of the shimmering Bahamian ocean. Harbour Island Bahamas is a small land mass off the east coast of North Eleuthera Island in the Bahamas. One of the most accessible of all the Bahamian Islands, Harbour Island Eleuthera offers the authentic Out Island experience. Home to the Dunmore Town, this historical treasure trove displays some of the Caribbean’s most well-preserved colonial architecture. 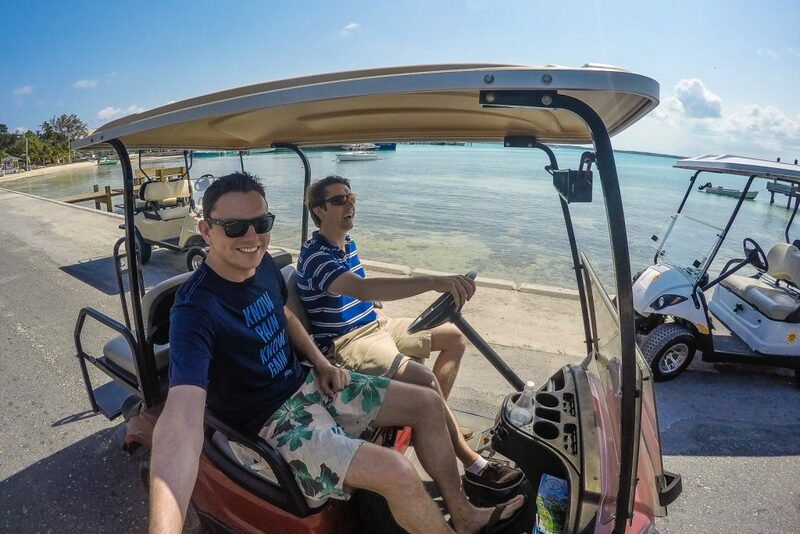 Since there are no cars on Harbour Island, most people travel around in golf buggies. Not only is this great fun, but it’s also indicative of how the weather stays sunny all year round. For many people, including a number of celebrities, Harbour Island is a great place to dock your private yacht. Strolling through the marina, you will see a number of luxurious yachts that are used to sail around the Out Islands. Climbing aboard one of these yachts and exploring the fantastic scuba sites around the island is not to be missed. To scuba dive or snorkel through this crystal clear water is an experience like no other. While each of these attractions are great, Harbour Island Bahamas’ most famous attraction is Pink Sands Beach. North Eleuthera flights from Florida will have you relaxing on this beach in a matter of hours. A wooden gateway adorned with thriving plant life meets you at the end of a sandy pathway, and you emerge onto Pink Sands Beach. The beach spreads out before you, and as the waves roll over the sand, it radiates a strong pink hue. A pair of horses trots through the shallows of the turquoise ocean as their riders explore Pink Sands Beach in style. Pink Sands Beach is the jewel in the crown of Harbour Island Bahamas. Its name is given due to the unique pink colour of the sand along the 4.8km beach. This picturesque phenomenon is caused by millions of microscopic Foraminifera shells mingling with the sand grains. These shells are a reddish pink colour and are particularly vibrant when wet. This means that the sand further inland may still have these shells, but doesn’t emit such a brilliant pink without the water’s interaction. The majority of Harbour Island Bahamas visitors travel here simply to view the famous Pink Sands Beach. While the colour of the sand gives it a unique edge, the beach itself is exceptional. Stretching out for kilometres in each direction, this is a great example of the Bahamas Out Islands’ staggering beauty. The elegance of the powdery sand and turquoise water is further enhanced by the spectacular tropical garden that fringes Pink Sands Beach. 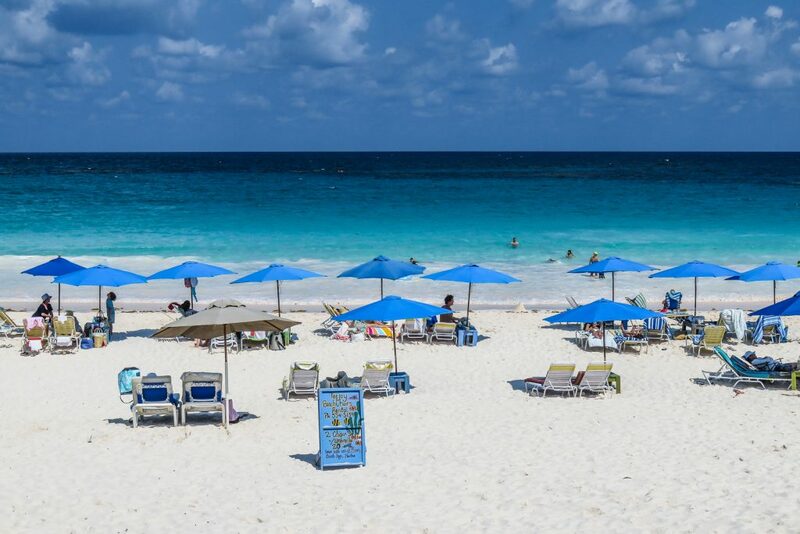 Visiting Harbour Island Bahamas even if for just a day trip, will give you the chance to sit back and relax on a sun lounger on Pink Sands Beach. Even if you’re not a resident at Pink Sands Resort, you will still be able to make use of the beach facilities and excellent beach service. 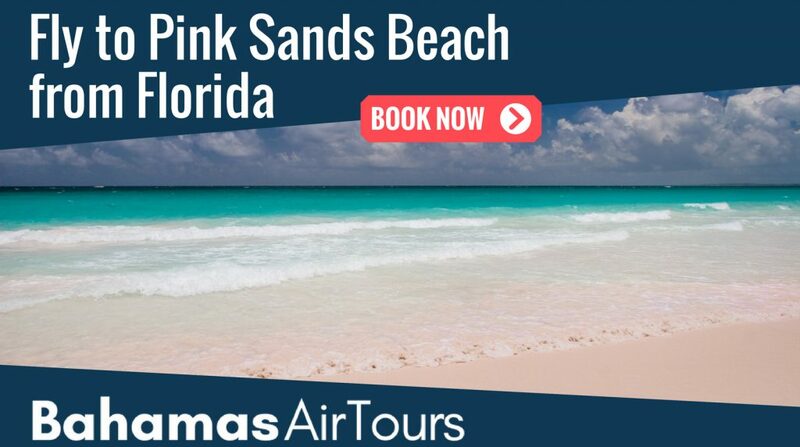 Lying back in a sun lounger with a tropical drink in your hand and the warm rays of the sun soaking into your skin is the idyllic vacation experience, particularly when in a setting as beautiful as Pink Sands Beach on Harbour Island Bahamas. 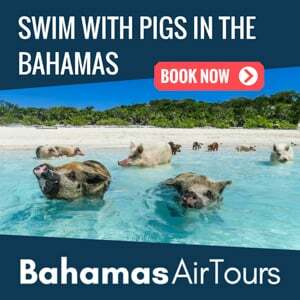 If you want to spend some time on Harbour Island Bahamas and enjoy Pink Sands Beach in all its glory, then the Pink Sands Resort is the accommodation for you. Your cottage will be steps away from the Bahama’s crowning jewel beach. You can go for strolls in the open tropical gardens or book a horse ride along Pink Sands Beach to view the entire stretch of sand with ease. The real beauty of this resort is that there are no barriers, no high gates or imposing walls. Everything is open, evoking an undeniable sense of freedom. You will also be surrounded by evidence of this island’s colonial heritage. What’s more is that most of the Pink Sands Resort staff have been working there for years. This gives the entire service experience a sense of familiarity and friendliness that is seldom found in such famous resorts. You may also find yourself dining, lounging, or even swimming beside celebrities, who travel from around the world to see this phenomenal beach. When you arrive at Pink Sands Beach on Harbour Island Bahamas, it’s popularity and fame amongst holidaymakers becomes immediately evident. The beauty of the beach and water epitomise the Bahamas’ Out Islands experience. The ambience of the beach blended with sunny skies, vibrant gardens and unique pink sand will immerse you in this tropical paradise. 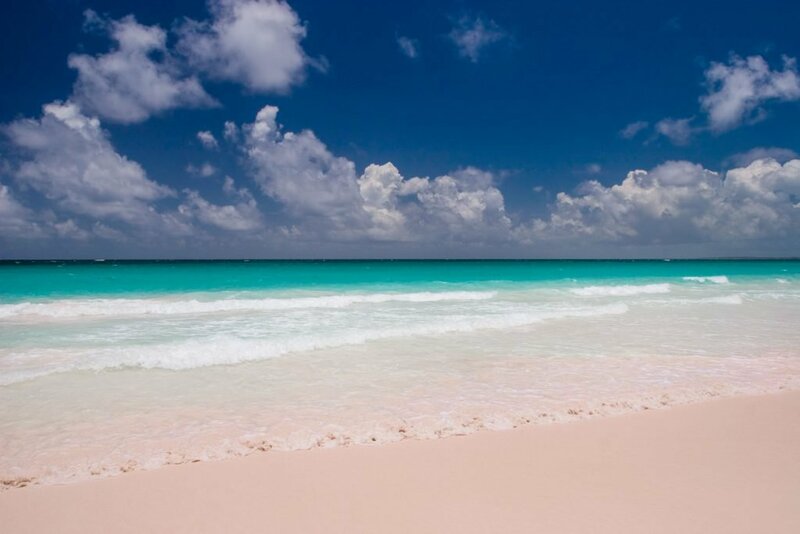 The fact that you can visit Pink Sands Beach on Harbour Island Eleuthera on a day trip from Florida makes this trip even more alluring. Pink Sands Beach can be located at (7) on our Harbour Island Bahamas Map. The warmth of the sun’s rays breathes a flickering light into the glistening turquoise water as you trot alongside the ocean. The chestnut steed carries you steadily along Pink Sands Beach, its hooves leaving prints in the sand that trail off behind you. The salty scent of the ocean washes over you on the breeze as a small wave crashes onto the sand. Your horse continues to walk along the beach, the water splashing gently off its hooves as the wave retracts from the pink sand. 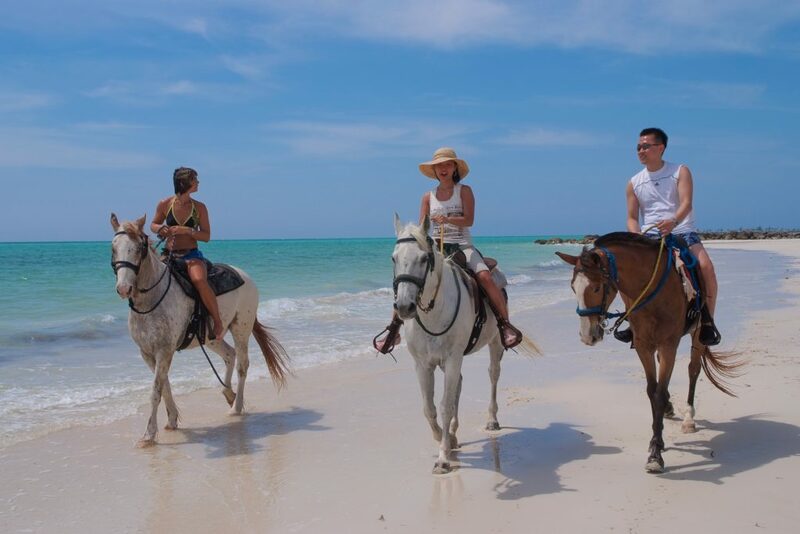 Horse riding along the Bahamian beaches is a very popular activity. Not only is it a fun and exciting experience in itself, but it also provides you with a unique way to view the marvellous beaches. Pink Sands Beach on Harbour Island Bahamas offers horse riding which is particularly worthwhile due to the beach being almost 5km in length. Harbour Island Eleuthera is 5.6km in length, which means that Pink Sands Beach stretches over 85% of the island. You will also feel a sense of freedom as you travel along this stunning beach. If you do plan to explore the entire length of Pink Sands Beach, then why not do it on horseback and combine your sightseeing with a fantastically unique experience. To think that you can book one of the North Eleuthera flights from Florida and spend a day riding horses on one of the world’s most famous beaches is truly incredible. As your golf buggy rolls through the streets of Dunmore Town you are surrounded by New England colonial style buildings. The excellent preservation of each building makes you feel as if you’ve been transported back in time. Since there are no cars here the air is clear and void of smog and sound pollution. The small, quiet lanes, historic architecture and palm trees take you back two centuries. The town was named after Lord Dunmore, who was the governor of the Bahamas between 1786 and 1798. Dunmore Town is steeped in history, having originally been built as the Bahamas’ capital city. The beautiful architecture echoes the time gone by, with wooden struts painted a variety of colours. These colours mingle with the naturally vibrant colours of the flowers, palm trees and vines that seem to drape the entire town. Add the beauty of the turquoise ocean to this excellent colour palette as a fantastic backdrop. The result is a particularly picturesque little town with a new and exciting adventure down every lane. Of all the buildings on Harbour Island Bahamas, the Loyalist Cottage is among the most visited and photographed. While it may be a private residence, simply viewing this building from the outside is enough. Built in 1797, this 220-year-old building still stands strong as a testament to the tenacity and preservation of Harbour Island’s buildings. A small plaque to the right of the front door bears the Union Jack flag and ‘Loyalist Cottage’ written around it. Harbour Island Eleuthera is a treasure trove of historical buildings and rich Bahamian heritage. The incredible ambience of Dunmore town due to its lack of cars is very relaxing. It really is the perfect destination to get away from the hustle and bustle of your daily life. In fact, it even serves as an excellent day trip from Florida. With colonial style buildings, beach buggies as transport and one of the world’s most famous beaches, a trip to Harbour Island Bahamas will certainly be unforgettable. 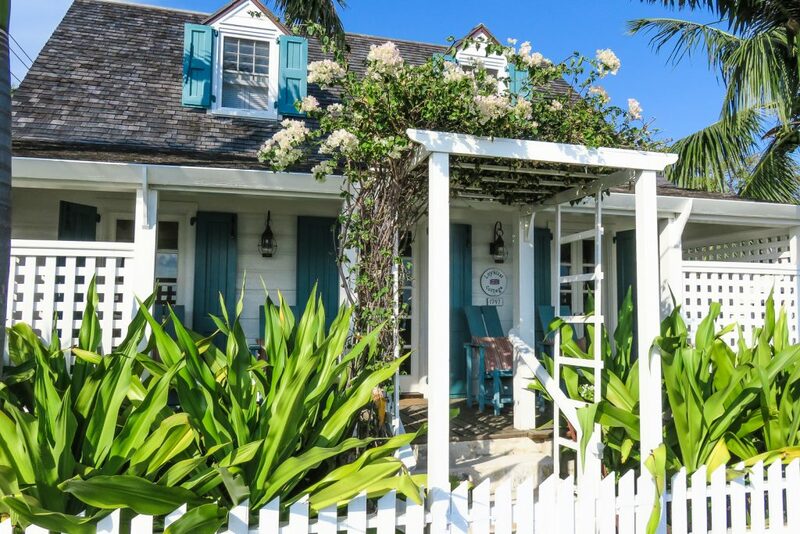 Loyalist Cottage in Dunmore Town can be located at (3) on our Harbour Island Bahamas Map. The Bahamas’ Out Islands have an abundance of spectacular scenery, beautiful terrain and exciting activities. Harbour Island is no exception to this, as long as you know where to look. Having come from North Eleuthera Island, you’ll rent a golf buggy and explore Dunmore Town and Pink Sands Beach. Most people tend to spend their day trip exploring these two destinations, but Harbour Island Eleuthera has a lot more to offer. If you take your golf buggy up to the north-west coast of Dunmore you will find a place to park and will be able to follow a trail down to the beach. You will be met with a slightly peculiar sight. Like many of the other beaches on the Out Islands, this beach is very flat, with a piece of driftwood as the exception. 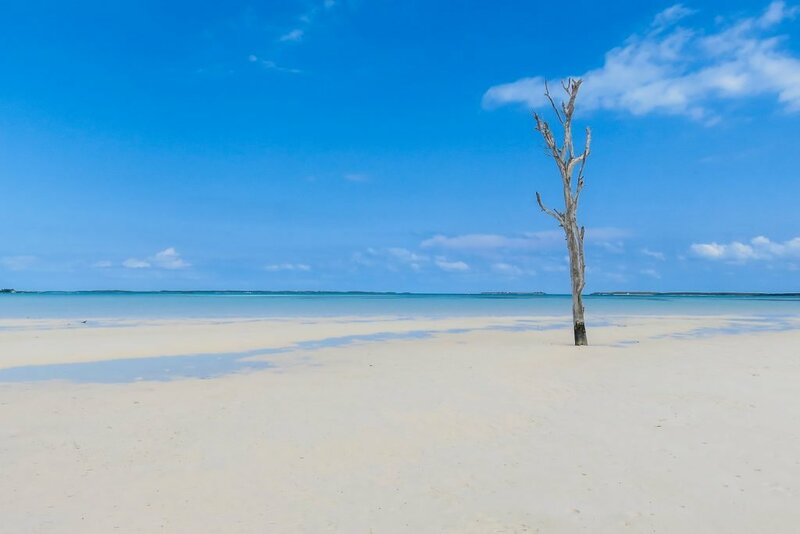 Known as Lone Tree, it stands out of the sand as if it’s a tree growing out of the beach. This fantastic driftwood provides an excellent and unique photo opportunity. Locals say that it washed up during a hurricane and anchored itself to Harbour Island’s northern shoreline. During high tide, the foot of Lone Tree is submerged, but still reachable on foot. This gives a nice variety to the photographs taken here. Lone Tree can be located at (5) on our Harbour Island Bahamas Map. One of the great buildings in Dunmore Town has fallen into disrepair. Formerly known as the Glen Stewart Mansion, it is now known as the Haunted House. While some locals may have ghost stories about the old place, it certainly seems to be nothing more than a deserted building. 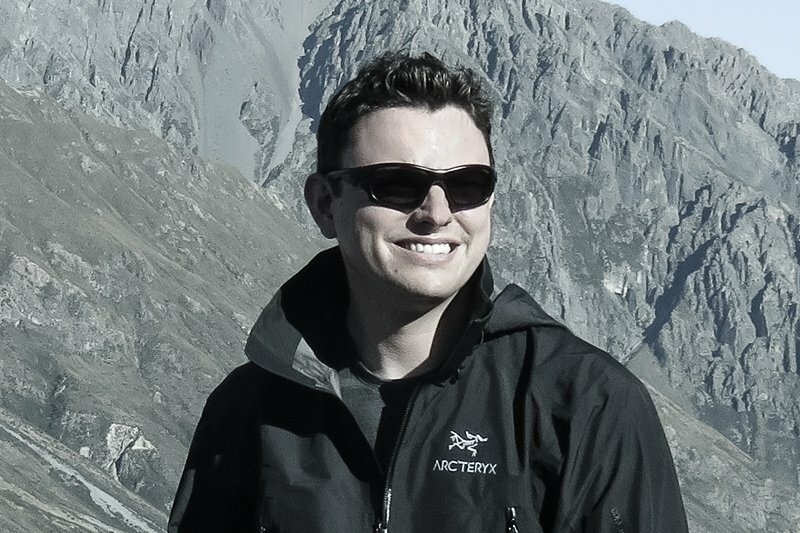 It also provides a great place for ‘post-apocalyptic’ style photography. 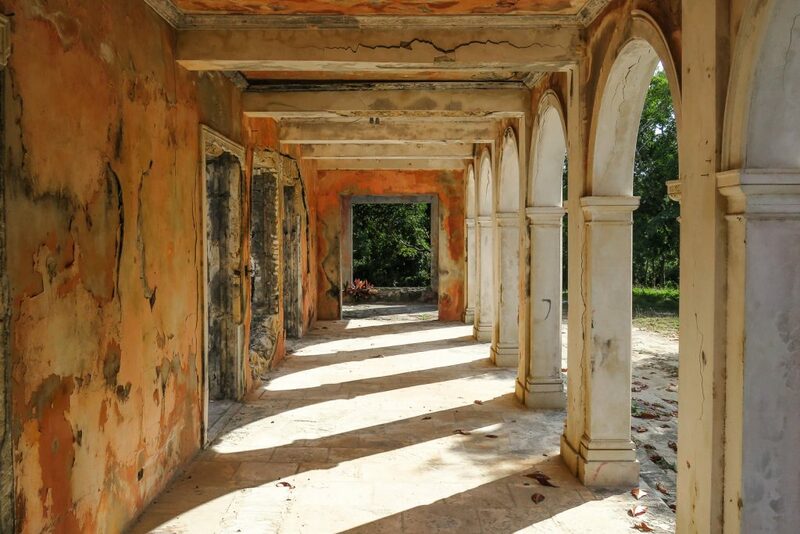 It also serves as an example of what the state of many of the buildings on Harbour Island would be in had they not been so well looked after and preserved. Seeing this historical gem is enough of a reason to book one of the North Eleuthera flights from Florida. 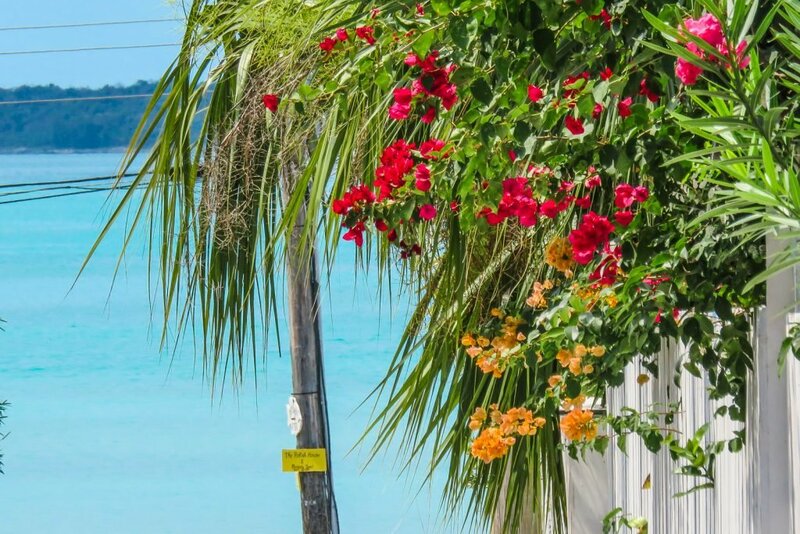 There is a lot more to Harbour Island Eleuthera than meets the eye. While a day trip from Florida may give you a chance to explore this picturesque island, the longer you stay, the more you will discover about this island’s rich heritage. Haunted House can be located at (11) on our Harbour Island Bahamas Map. While many people relate fine dining and seafood to lobster, the Bahamas brings a new flavour to your plate. Conch is the Bahamas’ national food. It is a white meat that comes from an ocean mollusc and is prepared in a wide variety of different styles. Since conch is a local delicacy, there is no better place in the world to try it. One of the best restaurants to taste conch for the first time is The Queen Conch on Harbour Island Eleuthera. 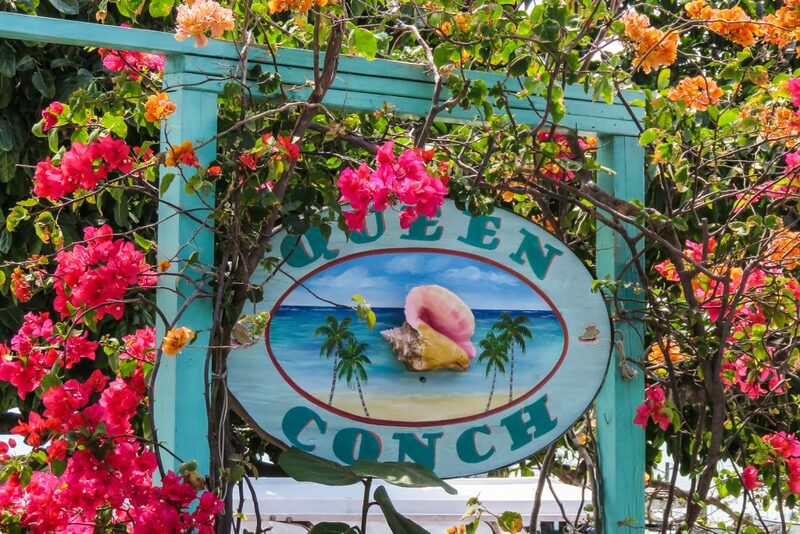 If you’re doing a day trip from Nassau or Florida, be sure to stop in at The Queen Conch to experience this Bahamian cuisine. Queen Conch can be located at (4) on our Harbour Island Bahamas Map. There are several different kinds of conch around the world, but the most popular and common in the Bahamas is the Queen Conch. This is, of course, where the restaurant gets it name from. Queen Conch has a fairly chewy meat that is just as delicious cooked as it is raw. Here in Harbour Island Bahamas, you can try conch salad which is chopped up with fruits and vegetables. If you aren’t looking for a full meal but still want to try out the flavour of conch, then conch fritters are for you. Cracked conch is the name given to conch that has been deep-fried in batter. You would mostly be served Cracked conch with spicy sauce and fries. If this isn’t filling enough for you, then you can order a cracked conch sandwich which places fried conch between slices of bread with lettuce, onions and spicy mayonnaise. 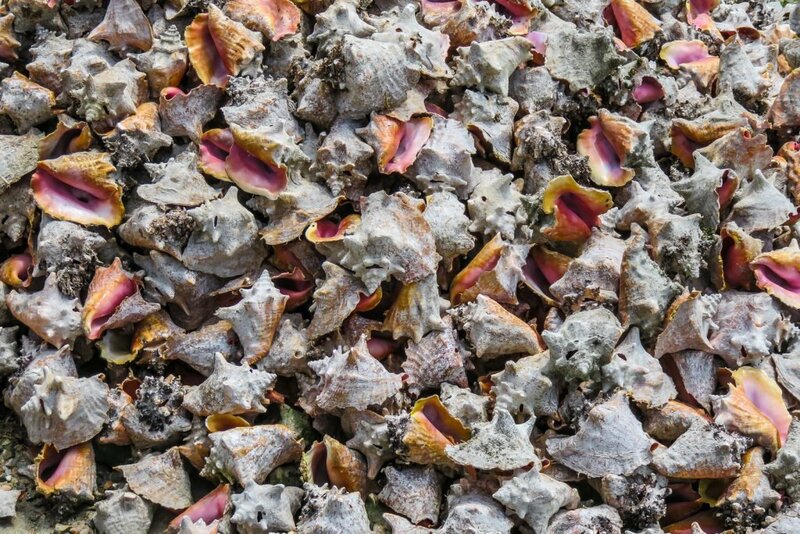 There is an abundance of conch living in the waters around the Bahamian Islands. This means that you can find conch almost anywhere in the country and eat as much as you like. There is nothing quite like arriving at a new destination and trying out the local delicacy, it really helps to immerse you in the culture. If you would like to further enhance your dining experience then you can top it off with a Bahamian Kalik beer. To glide along the surface of the dazzlingly blue ocean amongst the untouched beauty of the Out Islands is one of the world’s most scenic experiences. A fantastic sense of freedom washes over you as you cruise through the water, exploring the Bahama’s many attractions, both above and below the surface. There are fantastic fishing spots and a selection of picturesque sailing routes. Harbour Island Eleuthera has a number of excellent scuba diving sites nearby including High Head and Black Shoals. Of all the nearby dive sites, the Devils Backbone off the coast of Spanish Wells town is one of the very best. You will have the chance to snorkel and dive above a number of shipwrecks. There are also train wreckage’s from the Civil War era worth exploring. Discovering the beauty of the large coral head of Split Reef is an unforgettable experience. This wonderful reef has fan corals in a range of colours. High Head Reef, on the other hand, will have you swimming down the side of the steep coral shelf. Black Shoals is one of the best dive sites, with a range of different heads of coral. If you’re lucky, you may even spot a turtle or moray eel while exploring this underwater wonderland. 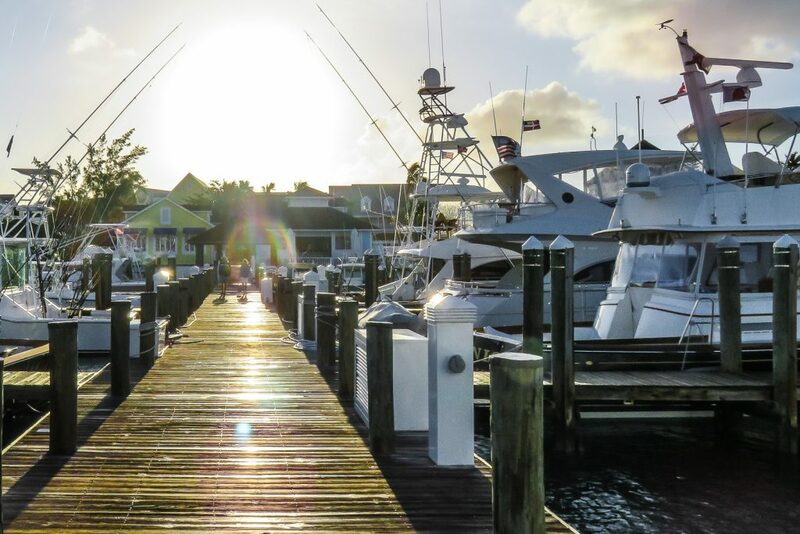 Boater’s Paradise: Valentines Resort and Marina in Harbour Island Bahamas, North Eleuthera Island. There are several marinas along Harbour Islands coastline. One of these belongs to Valentines Resort on the island’s west coast. This marina is also very useful for trips to and from North Eleuthera Island. If you’re staying at this resort you will have access to the marina, where you will be able to view the magnificent private yachts. The marina is well-serviced and provides all boat owners with a place to dock. It also provides quick access if they’re looking to go out sailing or scuba diving. 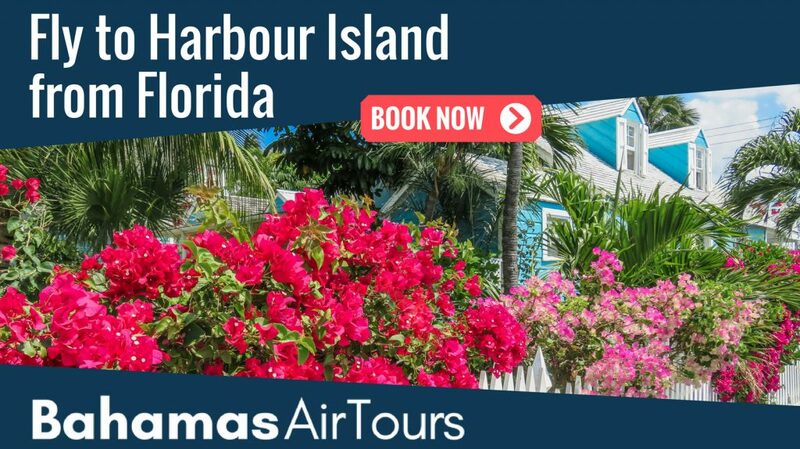 Valentines Resort and Marina can be located at (12) on our Harbour Island Bahamas Map. One of the best parts of touring Harbour Island Bahamas is that there are no cars. Everyone travels around in golf buggies. Not only does this allow for narrower roads and less sound pollution, but the experience of exploring Dunmore Town in a buggy is great fun. The open design of the buggy is perfect for sight seeing. If you’re on a day trip from Florida or Nassau, be sure to hire a golf buggy. Not only does it transport you around the island much quicker than walking would, but it also allows you to hop on and off with ease at each attraction on the island. You will arrive on Harbour Island Bahamas at Government Dock (1). This is where the ferry service from Nassau and the water taxis from North Eleuthera Airport dock. It is here that you can collect your golf buggy and begin your tour of Dunmore Town and the Pink Sands Beach. Take a quick look at the Straw Crafts (2), a collection of huts selling straw products; straw hats, bags and clothes. Following Bay Street north with the ocean on your left, you will arrive at Loyalist Cottage (3), one of the most photographed buildings in North Eleuthera. This colonial style house, dating back to 1797, was one of the first settlers homes to be built on Harbour Island. Continue north to a long straight section passing restaurants, fish-fries and shops. The Queen Conch (4) restaurant serves delicious traditional Bahamian dishes including its signature fresh Conch salad. The most Northerly stop on the tour is Lone Tree (5), an iconic attraction of Harbour Island Bahamas. Park your golf buggy on side of the road where Bay Street bends to the right and walk the short distance to the beach during low tide to find Lone Tree. From here, you can head south down Dunmore Street where we’ll make a quick pit-stop at the family run Arthurs Bakery and Cafe (6). The next left along Chapel Street which leads to the access point for Pink Sands Beach (7). Remember to take your Golf Buggy keys with you once you’ve parked! 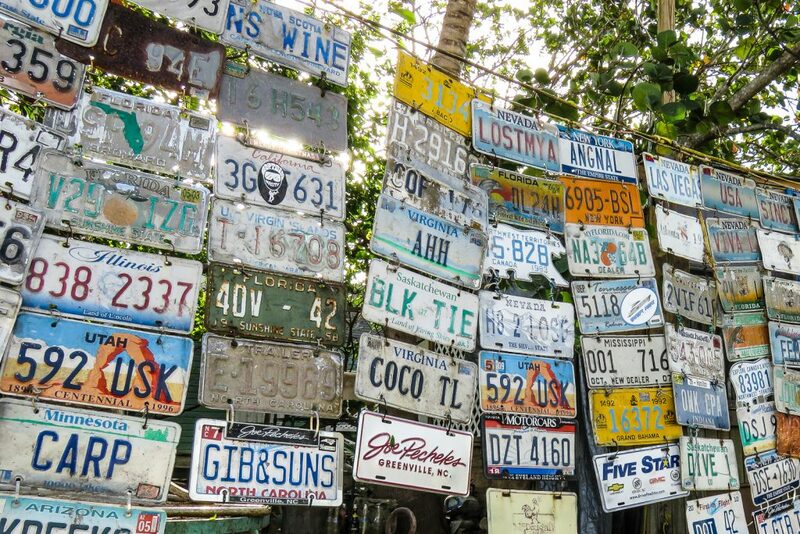 The “Wall of Licence Plates” in Dunmore Town, Harbour Island Bahamas. Having enjoyed your stay on Pink Sands Beach, head back into Dunmore Town to explore the south of Harbour Island Bahamas. Back onto Dunmore Street, heading south now, you can stop for photos at St Johns Anglican Church (8). This is the Bahamas’ oldest Anglican church, having been built in 1768. A block further to the south will bring you to the corner of Dunmore Street and Clarence Street. Here you will find the rather ornate Wall of Licence Plates (9) at Uncle Ralph’s Aura Corner. Go east one block and turn onto Colebrook Street. From here it’s a 5-10 minute drive down to Sunset Dock (10) where you will find the Haunted House (11). On your way back to Government dock, take a look at the private yachts moored up at Valentines Resort and Marina (12). Harbour Island Bahamas plays host to several excellent hotels and resorts. Each of these accommodations offer world-class service as well as exceptional facilities. Valentines Resort Bahamas is situated on the island’s west coast and provides truly transcendent service. This condominium-style resort displays one of the island’s best swimming pools as well as a private marina. You will also have the chance to stay in a luxurious sweet with its own kitchen. The dining, activities, events, nearby shopping and relaxing spa set the scene for the perfect Out Islands vacation. Of all the Harbour Island hotels, Valentines Resort and Marina is one of the very best because of its excellent facilities. The Boathouse Restaurant and the Rooster Tail Bar & Grill will have you dining in style beside the marvellous ocean. If you’re looking for a place to sit and enjoy a coffee with an excellent view of the picturesque marina, then Cocoa Coffee House has a table with your name on it. To book a scuba diving trip around Harbour Island Eleuthera, stop in at the Dive Shop and sign yourself up for the adventure of a lifetime. Valentines Resort and Marina also offers a state of the art fitness centre where you can keep up your daily routine. 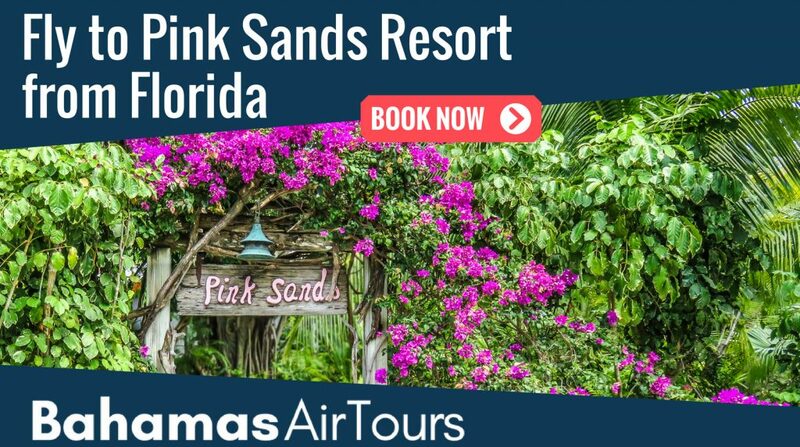 If you’re visiting to spend time on Pink Sands Beach, then Pink Sands Resort is for you. 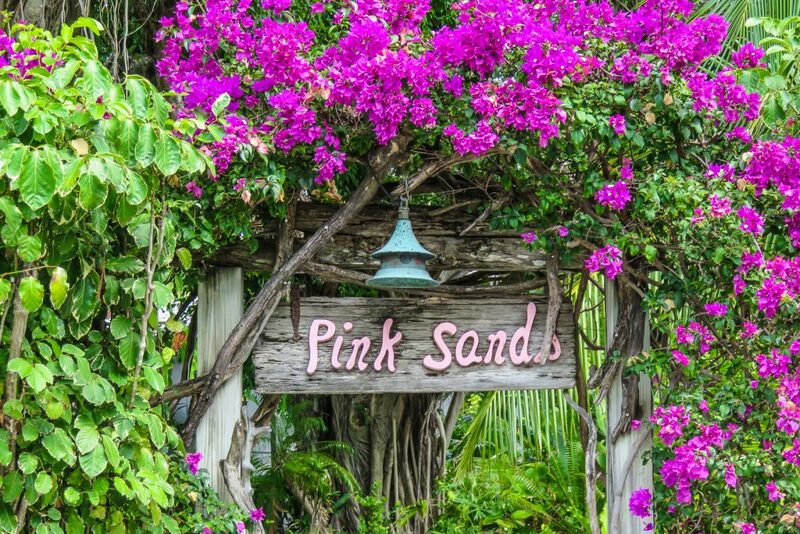 One of the very best Harbour Island hotels will have you sleeping just steps away from the famous Pink Sands Beach. The elegance and beauty of this resort cannot be overstated. However, the price for a night means that if you’re travelling on a budget, the Coral Sands Resort would be a better bet. Also bordering the Pink Sands Beach, Coral Sands Resort offers similar accommodation for less cost. Whichever one of the Harbour Island hotels you choose, you won’t be disappointed. While Pink Sands Resort may offer the incredible opportunity to be right on Pink Sands Beach, Valentines Resort and Marina has an immense value of its own. A visit to Eleuthera Island and in turn Harbour Island Bahamas is an excellent vacation idea. 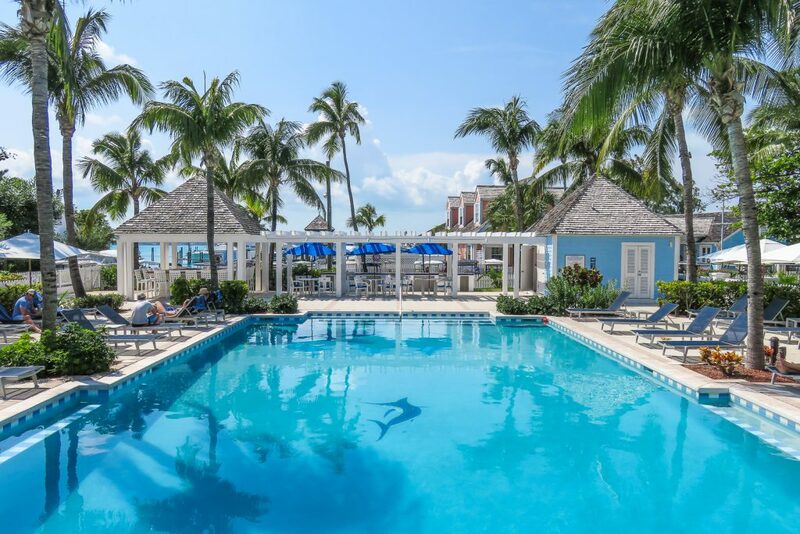 Whether you do a day trip from Florida or Nassau, or stay a night in one of the legendary Harbour Island hotels, your trip will be unforgettable. The hull of the boat glides across the calm turquoise ocean. You look out across the shimmering water, marvelling at its rich colour and incredible clarity. The salty ocean air whips past your face as you catch your first glimpse of the sparkling sand of Harbour Island Bahamas. The boat slows and you look down into the water to see a school of tropical fish swim past. The peace and elegance of the island envelope you in a wonderfully ambient atmosphere as you step off the boat. Harbour Island Bahamas is one of the most accessible of the Out Islands. There are several ways in which you can visit this fantastic island. 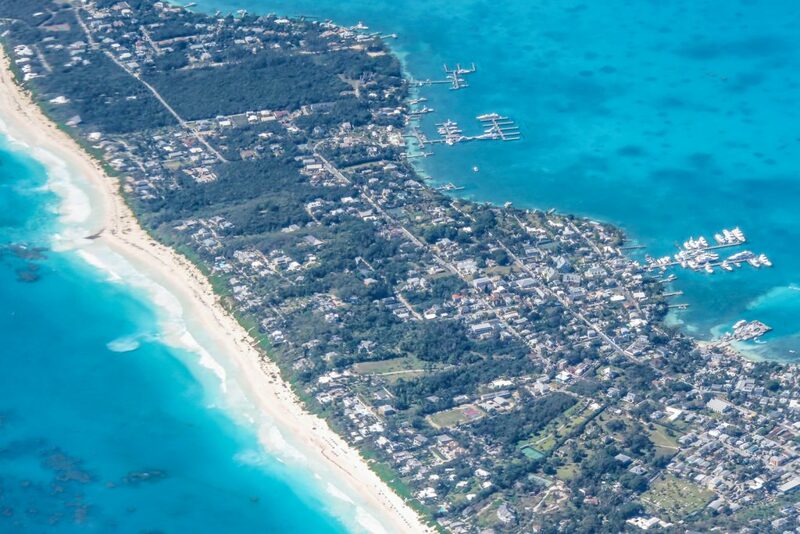 Many use Nassau as their base, doing day trips out to Harbour Island Eleuthera from there. It is far better, however, to look for flights to North Eleuthera Island and catch a taxi from there. If you’re in Florida, you can book one of the flights to North Eleuthera Island. 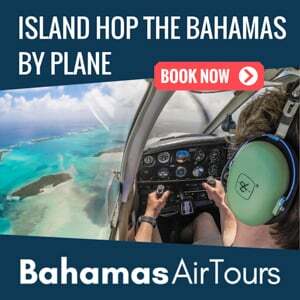 Taking one of these North Eleuthera flights will allow you to spend a day on Harbour Island Bahamas. The beauty of this trip is that you will also be transported to the coast of North Eleuthera Island by taxi. 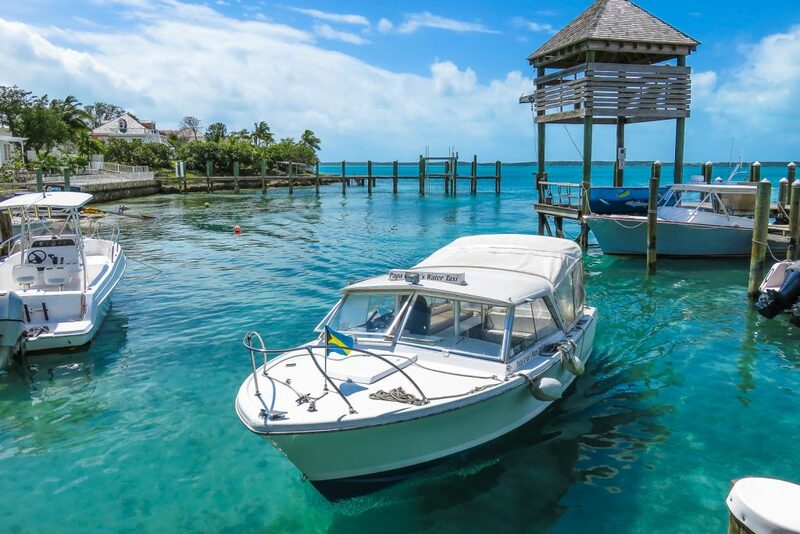 From here you will transfer to a water taxi on which you will skim over the glistening Bahamian water. There are exceptionally beautiful views as you fly into North Eleuthera Island. Seeing all these stunning Out Islands from above and spotting the distinctive colour of Pink Sands Beach is an experience like no other. 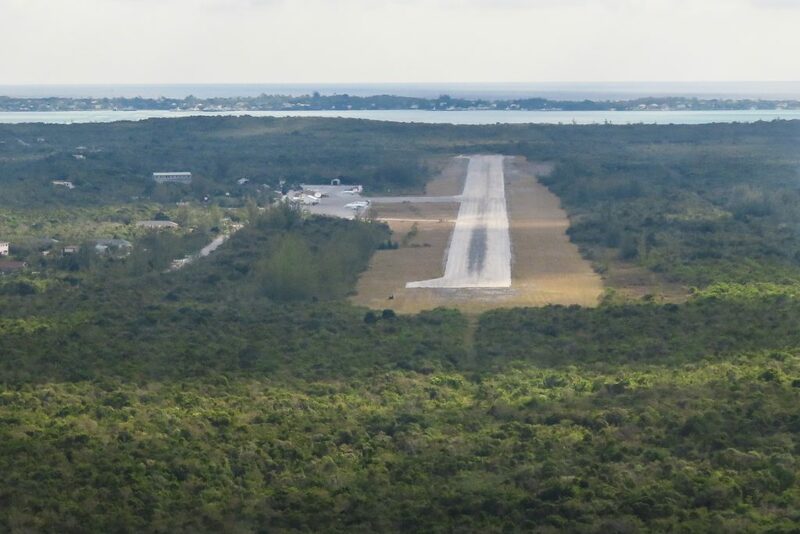 North Eleuthera Airport welcomes both commercial airlines and private pilots. 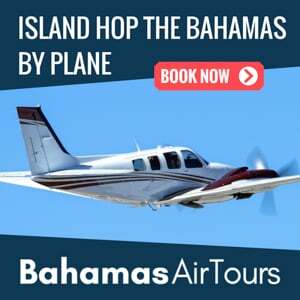 North Eleuthera flights offer a far more direct route for visiting Harbour Island Bahamas. Many people don’t realise just how close the Out Islands are to the USA’s South East coastline. In fact, a flight from Miami to North Eleuthera Island takes only an hour. This really puts the idea of a day trip from Florida to Harbour Island Bahamas into perspective. The beauty of Harbour Island Bahamas is simply staggering. The only real way to appreciate this mesmerising scenery is to view it for yourself. To walk along Pink Sands Beach and watch as the water interacts with the sand, turning it a brilliant shade of pink is a unique experience, to say the least. Exploring the quiet lanes of colonial Dunmore Town offers a fascinating historical experience. Discovering all of the town’s hidden gems and tasting the legendary Bahamian cuisine is the recipe for an unforgettable vacation. If you’re looking for an authentic Out Islands experience, don’t waste your time with a trip to Nassau. 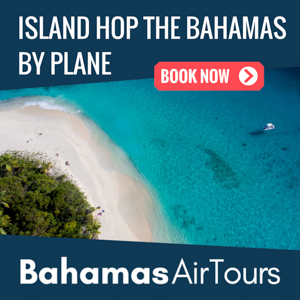 Flights to North Eleuthera will transport you right into the paradisiac atmosphere of the Bahamas. 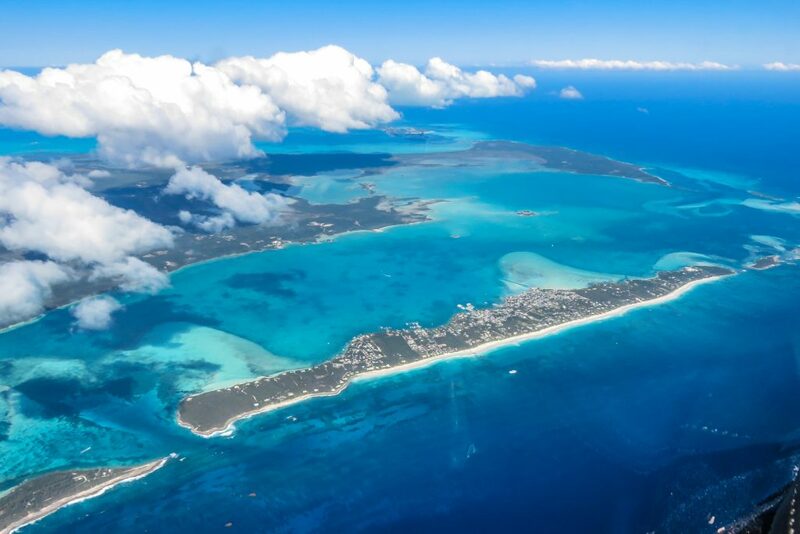 Not only are North Eleuthera flights practical, particularly from Florida, but they are also incredibly scenic. To slowly descend onto North Eleuthera Island while looking out the window at the splendid terrain is a marvellous experience. 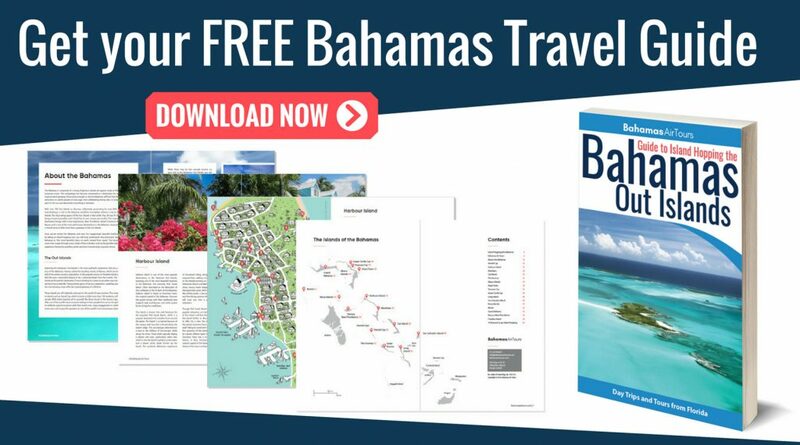 If you’re already looking up flights from Florida to North Eleuthera Island, check out our Bahamas Travel Guide to ensure you’re fully prepared. 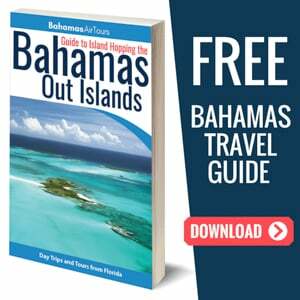 Take a look at our Top Things To Do in the Bahamas article to get an idea of what other attractions this exceptional archipelago has to offer. I would like to know if you could give me prices on horse back riding on Harbour Island. We will be vacationing in the Bahamas in October and were thinking about going there. I would really appreciate it.